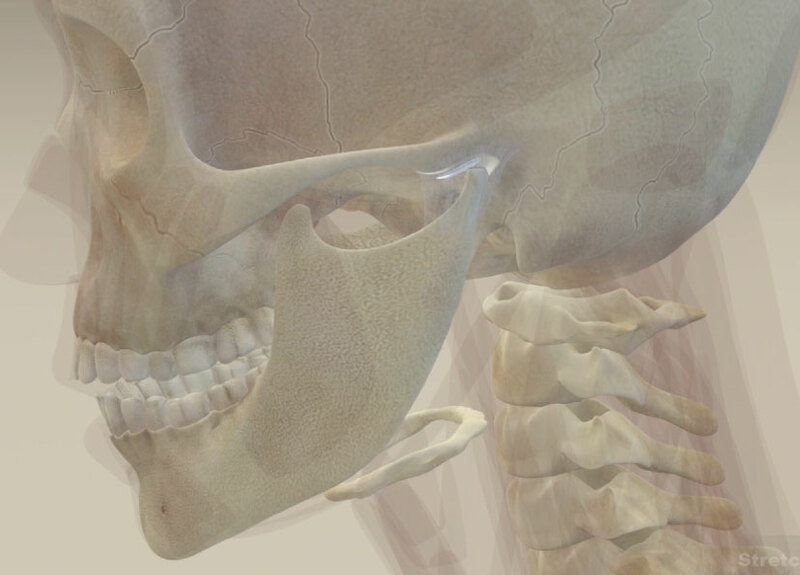 In the video on this page, expert and online Osteopath Tim Judd explains the triggers to jaw pain and jaw problems, how the jaw functions and the reasons for discomfort and pain in men and women. Now that you understand what causes jaw pain and jaw problems and how to prevent the most common jaw problems, it is time for targeted exercise to improve the range of motion. Click here for a sample of just one of the Neck Stretches available to you. For immediate relief of jaw pain, tension, or jaw stiffness and fatigue, go here for Essential Jaw Exercises that can relieve stiffness and discomfort, or add to cart now. 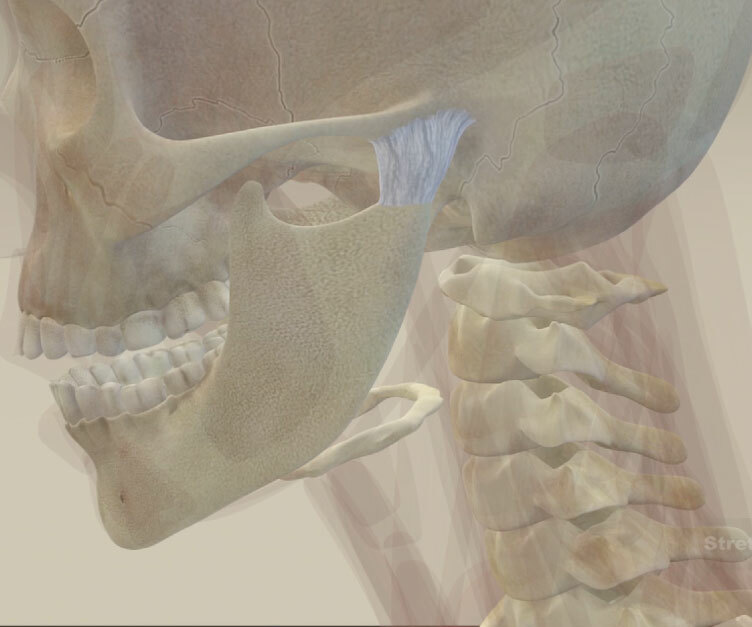 Learn about jaw pain and jaw joint pain relief through medical anatomy and 3D animation. What causes chronic jaw problems? What are the most common jaw conditions? What is the temporomandibular (TMJ) or mandibular joint? What is temporomandibular (TMJ) syndrome and TMJ disorder? What is the relationship between your neck muscles and jaw muscles? Understand the symptoms of arthritis. How do you stretch your jaw? Jaw and neck tension are closely related, partly because of the proximity of the jaw joint to the top vertebra in your neck and partly because of the greater number of neurological connections between the emotional centres in the brain and the muscles of the jaw, neck and shoulders than in other parts of the body. Also the muscles of the jaw are the strongest muscles for their size in the body. The jaw is quite a complex joint. It has a small semi mobile disc in the middle and it has a two-stage action. In the first stage the jawbone rotates and the second stage is a glide. So when there is too much tension in the muscles of the jaw there is increased compression within the joint and the disc can be dislodged and the ratio of the slide to glide can be altered. This is most often what causes the jaw to click. So with the jaw there are two things to note. One: does your jaw click and two: how much tension is in the muscles of your jaw. If your jaw clicks when you talk or eat then it will generally be that the jaw muscles are too tight and there is too much compression in the joint or, the joint is too loose or hyper mobile. If the joint is too tight then you probably have a lot of tension in the muscles of the face and need to address this problem. If one side of the jaw is too loose it could be caused by too much tension in the opposite side, creating an imbalance and jaw pain. One of the first things to notice is if your teeth are touching while you are at rest. Subtle clenching of the teeth often creates ongoing and unnecessary tension in the muscles of the jaw. This not only causes face and jaw pain but it drives the jaw bone up into the skull and puts a lot of pressure on the disc within the joint which eventually can be displaced and worn down resulting in arthritis and possible surgery. So, just take a moment and be aware of the tension in your face. Check if your teeth are together and to what degree you may or may not be clenching. If you have too much tension in the muscles of the jaw you need to remedy it. When the tension in the muscles builds up from over-use, there is such a drag on the attachment point that the tendon and even the bone can become very inflamed causing jaw pain. Stretching on its own is usually not enough to rehabilitate jaw muscles, but combined with massage, the results are generally really good.Whatever your situation these exercises will be exceptionally beneficial for relief, repair and maintenance. An understanding of good posture will be of great help as well. To read more from Tim’s Blog click here. To check out Tim’s Auckland practice click here.